One of the best parts about blogging is getting to receive some wonderful "surprises" in the mail quite often... aka PR packages! 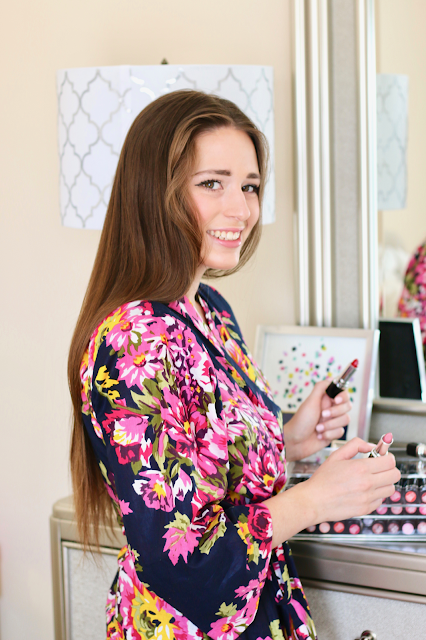 In today's post I'll be reviewing some of my favorite ones from this spring! Today's post contains affiliate links. Thank you for supporting Southern Belle in Training. I've been blogging for five years come September, and it was in my second year of blogging that I first began working with companies (mostly Etsy shops or start-ups) for collaborations. I had a slow start to get into blogging- my whole freshman year of college I really did it only as a hobby outside of classes since I loved fashion! 😊 So when I first began to work with brands, receiving a product was the payment for me writing the blog and social media posts about the item and company. This is probably one of the best PR packages that I've ever received, no lie! When Avon reached out to me and said they wanted to send me a gift, I assumed it would be skincare samples. Not sure why I assumed that, but I did. 😉 Boy was I wrong when I opened this! Avon ended up sending me the entire new True Color Lipsticks line, plus some bonus colors as well! And the best part was it arrived in the most darling makeup holder, that they personalized for me with my Instagram name on top. I was so touched! 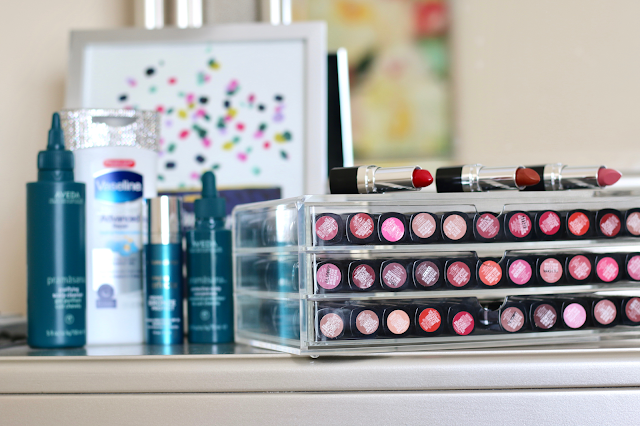 The True Color lipstick line has 40 colors in all shades of the lipstick rainbow, and two finishes, satin and shimmer. I actually don't wear lipstick to work too often- partly because I dress down for work so many days of the week, and partly because in a job where I talk all day long most lip products just fade right off. Getting all of these pretty things in the mail has definitely inspired me to start making my work lip routine a little more fun again though! So far I've tried two of them. The color pigmentation on both was amazing, and they didn't dry out my lips which was great! The only downside was that neither lasted more than a couple hours before needing to reapply, but I would rather have that happen than a product that made my lips really dry. I've been receiving packages from Aveda for about a year now, and this was one of my favorites that they've sent! These two products are specifically designed for scalp care. 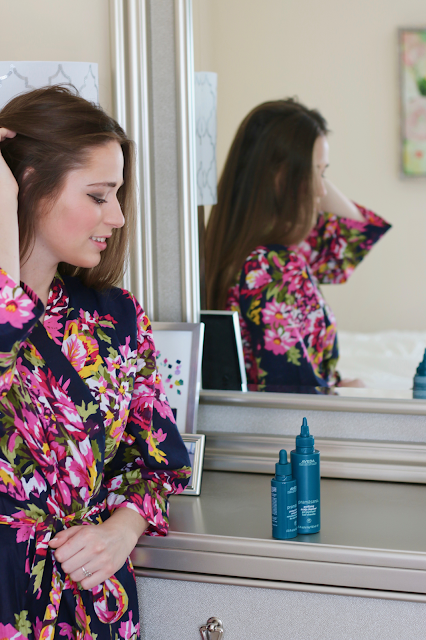 I have very thick hair which naturally can hold heat styles well for a couple days, however my scalp is prone to grease very easily, so at the same time I'm also best if I wash my hair daily (and I almost always use clarifying shampoo to combat my scalp's greasiness!). I've been using each of these products about 1-2 days a week. I wash my hair at night and then style it in the mornings. I don't usually use these at the same time, so I'll use one of them one night before heat styling, and the other on another night. So far I've been seeing great results with both! My scalp has definitely been less greasy since I've used them, and they also smell great. I'm a much bigger perfume gal than I am a lotion fan actually! I've had bad experiences with some lotions in the past giving me horrible eczema/rashes. (Really the only lotions that I use now are the boring anti-eczema ones, lol!) 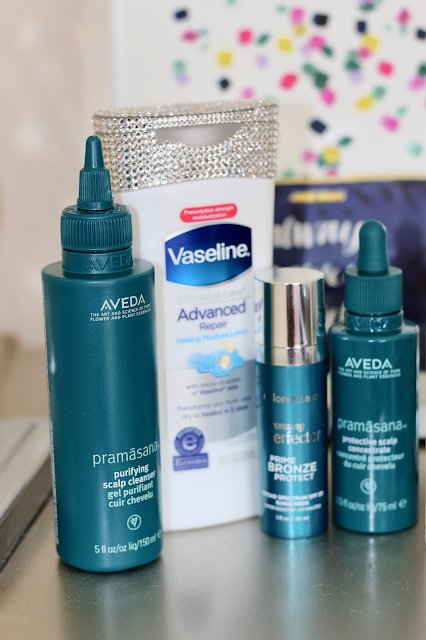 Vaseline sent me some of their Advanced Repair Lotion to try a couple of months ago, with a beautiful bedazzled lid, which of course made me excited to try it. I still haven't used a ton of this lotion since overall I'm not a big lotion person, but the times I have used it I haven't had a bad reaction to it! It doesn't really have much of a scent, similar to the anti-eczema lotion that I used before. I'm just still on the hunt of course for a great smelling lotion that wont' irritate my skin. The last product that I received to review I wasn't able to get a good close up photo of (My dad took these photos for me when he was visiting- I think he did a great job overall but the last couple photos in which I was holding this item didn't come out so well. 😉), but you can see it featured in the first few photos of the post where all the products are featured! It's the Colorscience Bronzing Perfector, which is like a liquid bronzing moisterizer that also has SPF! Talk about a 3-in-1 product. This product looks very orange when it first comes out, but as soon as I started putting it onto my face it blended perfectly with my pale skin tone, and left me with a gorgeous and natural (not orange) glow. So far I like this product! 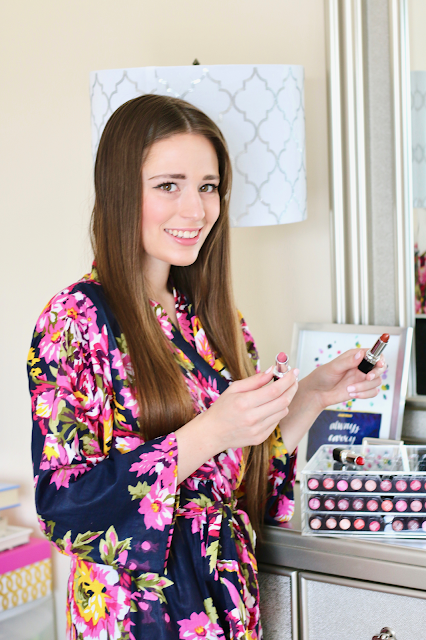 I'm linking what I liked and a similar bathrobe to mine below! My robe was a bridesmaids' gift from the wedding that I was in a couple months ago, but I found a very similar one. P.S. There is a HUGE online sale going on today at one of my favorite retailers, Lauren James! Their clothing and accessories don't often go on sale, so take advantage of this today. It starts at 12 pm CST today. That lid looks AMAZING!!! I am absolutely obsessed & married to using Vaseline's lotion. I have yet to have been disappointed. It is the bom diggity during times where my skin is super dry...so, especially in the winter. My go to is Vaseline Lotion Cocoa Radiant!!! That is so much lipstick! I wouldn't even know what to do with it! I do love those Aveda products though! Aveda products are my favorite! Such a fun post! I need to try them out! So many goodies!! I always love getting these surprises in the mail! Excuse me over here with a dropped jaw thanks to all that lip stick! Dang girl! 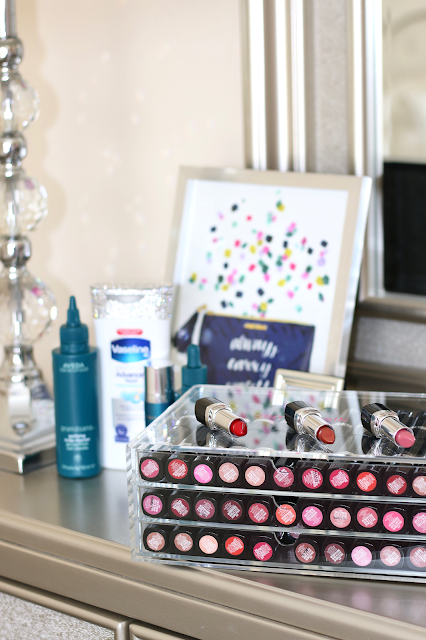 You have the perfect completion to rock a bold lip. Love that robe, perfect for bridesmaids:)! OMG lipstick jackpot! I love the case it came in too! So I'm not sure if you've ever thought about this or not but doing videos of opening this type of thing are HUGE on YouTube. I watch at least one every day. Those lipsticks look amazing. Love the robe! I've been trying to find the perfect one for my girls but unsure if I should do robes or just like a cute PJ set or even a chambray shirt. How did you feel about getting the robe? You've gotten some great packages! I love that you explained the difference in PR packages and sponsorships...not everyone understands that. Even some bloggers don't get it. That lipstick case sounds adorable and what an awesome PR gift! Those lip colors look pretty amazing! Might have to check them out. All that lipstick is giving me all the heart eyes! Omg, that vaseline has such an amazing blingy lid! And I also have super thick hair, so the Scalp Concentrate is something I'll have to check out! So jealous of that lipstick collection!! I loved reading this post! This is so nice that you got so many lipsticks! And I love Aveda products too! ahhh so many lipsticks! Your robe is so cute, great gift to have gotten! The Vaseline lotion looks good! I want everything Lauren James lol. That robe is so cute! And it's so rad how you've been getting so many cool PR packages! This is a great package!!!! I need to try that Vaseline lotion! These products all sound so great. I think I'd actually jump for joy if I received that many lip colors in one package haha! And the bedazzled Vaseline lid is too cute! This is such an awesome package! I love vaseline it is the best! That lipstick set is everything! Congrats on 5 years...I love your blog! I got those Aveda scalp care products too, and I've been meaning to try them out since I've heard so many amazing things! That Avon lip package sounds like the best gift ever! I loove Aveeda products! They're my favorite! I love those lip shades too! Thanks for the recos! I am needing some scalp lovin this summer. I will check out these Aveda products! I received the Aveda products too. I love them! What awesome goodies you got girl!! 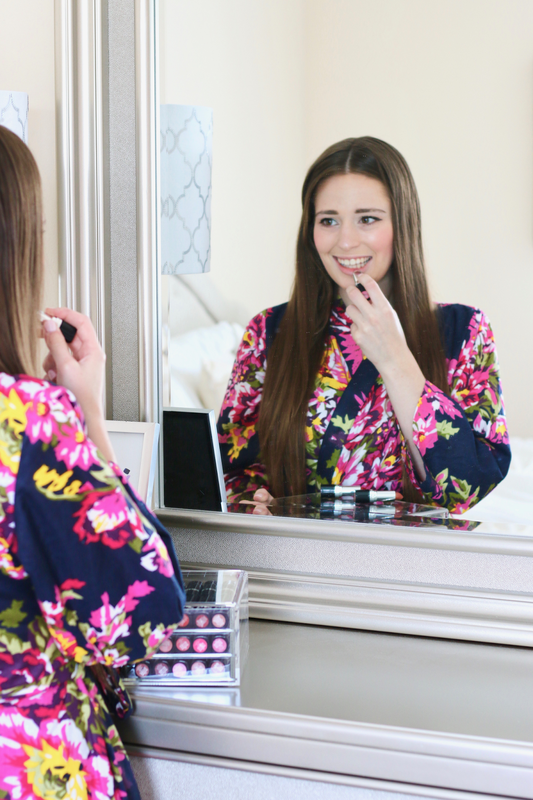 I'm obsessed with your floral robe! You look amazing!